The turning point in the history of Slovakia which proved crucial for the development of architecture and art was the incursion of the Tartars in 1241-1242. The devastation they wrought demanded immediate reconstruction and renewal. King Bela IV recalled foreign colonists to the country, offering them various privileges and freedoms, leading to the establishment of many new free royal towns. Their citizens – burghers – came to form the fourth social status and to represent a significant political and economic factor. The new colonists, known as ‘guests’, comprised of mainly Germans, Walloons and Italians. They did not found completely new towns, but settled in old market settlements, some of which already enjoyed town privileges (Trnava, Krupina, Zvolen, Banská Štiavnica) and which they quickly managed to dominate. Following the examples that they brought from their own countries, they built towns with a fixed urban structure and defined parcelling which, in the most important localities, has remained until the present day. These old urban structures, with their original architecture, are currently protected as town conservation reservations. Their exact development is still not completely clarified and historical research still brings new, surprising discoveries. The origin of stone castles represented another consequence of the Tartar incursion. Stone constructions were the only ones that could withstand Tartar attacks. The King had stone watch-towers and fortifications with permanent garrisons built at all strategic points at the borders of the kingdom and on main road routes, as well as in places of older, wooden hill-forts. Royal property soon fell into the hands of the aristocracy who received it as a gift in exchange for military or other service. Castles also served as administrative centres and the residences of major lords. The architecture surrounding the original fortified towers grew relatively fast into Gothic castles, often comprising a keep, a residential palace, a chapel and other buildings of military or economic character. They were protected by a system of walls, bastions, drawbridges and trenches. Castles in the lowlands were generally enclosed by a water-filled moat. Apart from the principal castles, minor castles and mansions were also constructed, along with residential stone towers and economic buildings on baronial estates, enclosed by stone or wooden fencing. These structures had residential, economic and fortification functions and many of them became the basis of later mansions. Over the centuries, many castles changed into significant representative residencies which dominated the surrounding neighbourhood. Their construction and artistic decoration followed several artistic styles. However, during the anti-Habsburg uprisings many castles served as centres for the rebellious aristocracy. Consequently at the beginning of the 18th century the majority of them were intentionally destroyed. Many of them still exist today as ruins and only a few of them are in sufficiently good condition to permit their use as museums with permanent exhibitions. Spiš Castle is the largest castle in the whole of Central Europe. Among others, museum exhibitions are located in Bratislava Castle, Červený Kameň Castle, Bojnice Castle, Trenčín Castle, Orava Castle, Zvolen Castle, Krásna Hôrka Castle and Ľubovňa Castle, as well as in the town castles in Banská Bystrica, Banská Štiavnica, and Kremnica. The most picturesque ruins include the castles at Beckov, Čachtice, Strečno, Lietava, Turňa nad Bodvou and others. There are almost 200 castles in Slovakia that represent significant elements of cultural and natural countries and, at the same time constitute one of the characteristic features of Slovak cultural heritage. The arrival of foreigners in Slovakia was amply reflected in the art style. These guests brought with them the knowledge of advanced Gothic forms, but they also encountered existing domestic Romanesque traditions. The second half of the 13th century therefore saw a mixture of two styles and the gradual use of the Gothic style. The early 13th century witnessed the construction of many new rural churches. These were single-nave churches, initially with a semicircular or square presbytery, later with a polygonal closure, with or without a tower. The first town churches in the clear Gothic style were built in the second half of the 13th century. The exponents of this style included mainly the Mendicant orders, namely the Franciscans, the Dominicans and the Clarisse. The Premonstratensian monasteries in Šahy and Kláštor pod Znievom represent significant architectural examples of the new style. 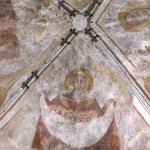 Unique medieval monuments are the wall paintings preserved in many churches. 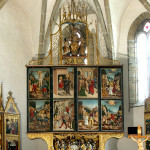 Their style was inspired by Italian and Byzantine paintings as well as by French book paintings, representing Biblical scenes, scenes from the life of Christ and the saints (Plešivec, Štítnik, Ochtiná, Šivetice, Koceľovce, Martinček, Žehra). One particularly popular legend was that of Saint Ladislav (Rimavská Baňa, Kraskovo, Kyjatice, Veľká Lomnica). In Spišská Kapitula the secular motif with King Charles Robert is exceptional. Secular motifs were more often used in fresco paintings in castle palaces and burgher houses. Wall paintings belong to the most valuable elements of Slovak cultural heritage and their restoration represents one of the priority tasks of the protection of monuments. Altars and wooden sculpture with polychromy, mainly showing beautiful Madonnas, represented another popular element in the interior design of Gothic-style churches. In the 14th century, following the consolidation of the situation in the Kingdom of Hungary resulting mainly from the extinction of the Arpad dynasty and the accession of the Anjou, the Gothic style was consistently pursued. 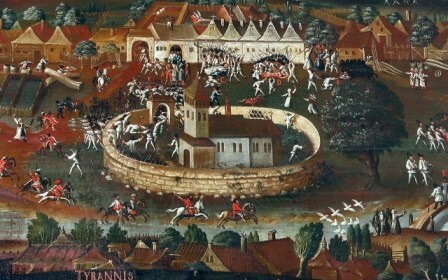 Thanks to support from the King and the increasing exploitation of precious metals, the Kingdom of Hungary began to enter the international markets and a major economic boom was experienced in the towns. Burgher houses and patrician palaces were constructed around quadratic or lenticular squares dominated by monumental parish churches (Levoča, Bardejov, Košice). 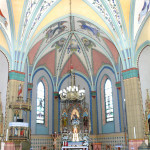 Spital churches devoted to Saint Elisabeth also originated in the 14th century. Towns of this period protected their possessions through a system of massive walls with bastions, entrance gates and moats. In the 15th century, the late Gothic period brought about an increased tendency towards finesse and some popularisation. Not only churches, but also burgher houses were decorated with complicated stonemasonry fragments. Paintings of ornaments, plants and animals in different colours, mainly red and green, also became popular. The greatest building and art activity was concentrated in the economically strongest central Slovak mining towns and in the towns of Spiš and Šariš. Bratislava became the artistic centre during the reign of King Žigmund of Luxembourg. Along with churches, Town Halls (Bardejov) came to dominate squares. Regional differences led to the division of Slovakia into western, central and eastern Slovakian art styles of Gothic. Visual art began to show new content and formal components with a tendency towards the realistic substantiation of characters and the surrounding environment. A work of world importance from this period is the sculptural production of Master Paul of Levoča. The tabular, wing altars that came to decorate almost all medieval churches represent the jewels of Late Gothic Slovak architecture. The Gothic style penetrated all types of art, all social segments and all regions of Slovakia. The stormy events of the following centuries caused Gothic architecture to remain conserved in its original form. To this day the monuments created during the Middle Ages, ranging from burgher houses, churches and monasteries to castle ruins, considerably determine the character of the Slovak countryside, invoking the archaism of Slovak culture in a very lively manner.